Nancy graduated from Boston College with a Bachelor of Arts Degree in 1984. She graduated from Simmons College with a BS in Physical Therapy in 1986. Nancy’s clinical experience has included pediatrics, specifically home-based early intervention. Since 2008 she has focused on out-patient orthopedics, including the spine and extremities. She enjoys working with patients of all ages, utilizing manual techniques, therapeutic exercise and modalities. Nancy is a very dedicated and energetic therapist who is determined to help her patients achieve their functional goals. 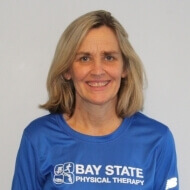 Nancy has been with Bay State Physical Therapy since 2008. She enjoys running, hiking and “boot camp”. She has four children who keep her very busy with all their activities, such as drama and sports.